Obsidian is a natural glassy rock that was produced by volcanoes and used by pre-contact people across North America for making stone tools. Obsidian is the sharpest naturally occurring substance on earth, which made it ideal for making tools such as arrowheads and knives that were designed to slice animal flesh. Many obsidian tools have been found in Alberta despite the fact that there are no natural sources of it in the province. This means that obsidian was traded or carried into Alberta from long distances away. Research on obsidian tools at archaeological sites in Alberta has been conducted on a small scale since the late 1980’s. The current Alberta Obsidian Project (AOP) is the first large-scale attempt to analyse our province’s obsidian; it began in 2014 when a research plan was developed by members of the Archaeological Survey of Alberta, the Royal Alberta Museum, and the Center of Applied Isotope Studies (CAIS) at the University of Georgia. Members of the Alberta Obsidian Project would like to thank all the contributors who have made the initial year of the program a success. Each volcanic outcrop of obsidian from Alaska to California has a distinct signature of chemical elements, so, archaeologists can compare the signatures of obsidian artifacts found in Alberta to volcanic outcrops in order to determine which volcano the obsidian came from. By drawing a line from an Alberta artifact back to its volcanic origin, we can begin to reconstruct trade patterns, migration routes, and social networks across the continent. For example, did you know that an obsidian scraper found near Fort McMurray was originally quarried by people in Wyoming? Or that a spear head from the Red Deer area that is roughly 10 000 years old is made of obsidian from central Idaho? 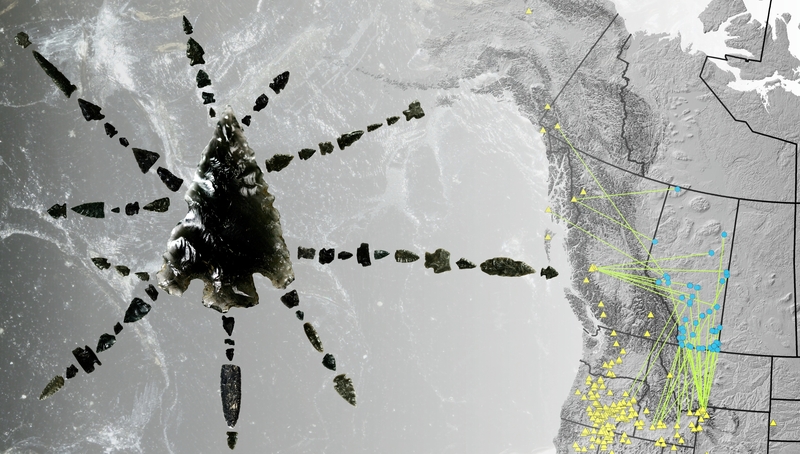 Obsidian artifacts in Alberta have also been traced to volcanic sources in Alaska, Oregon, and across British Columbia. In 2014, members of the Archaeological Survey and Royal Alberta Museum gathered over 800 obsidian artifacts found in the province for geochemical work. In early 2015, Dr. Jeff Speakman and Travis Jones from CAIS analysed the artifacts using a technique called portable X-ray fluorescence. The research team is currently interpreting results, which will be entered into a provincial database available to archaeologists across Alberta and North America. Travis Jones will build the results into a PhD that explores ancient obsidian use east of the Rockies. 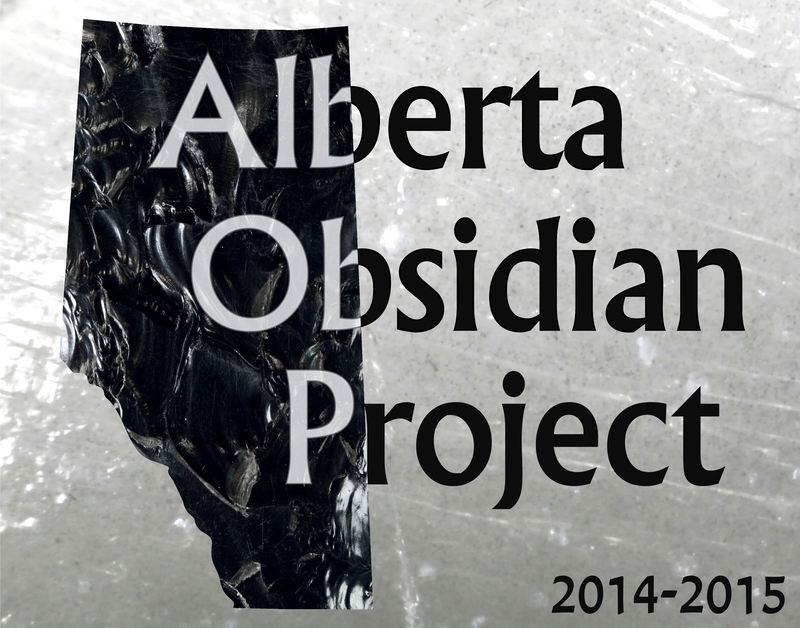 Members of the Alberta Obsidian Project would like to thank the many collaborators that have made the 2014-15 component of this project a success. Many landowners kindly loaned artifacts for analysis as did local museums (the Brooks and District Museum, Didsbury and District Museum, Whyte Museum of the Canadian Rockies, Fort Saskatchewan Museum and Historic Site, Homestead Antique Museum, the Pioneer Museum in Grande Prairie, Stettler Town and Country Museum, Manning Battle River Pioneer Museum, Red Deer Museum and Art Gallery, Donalda and District Museum, Fairview Pioneer Museum, High Prairie and District Museum, Homestead Pioneer Museum, Peace River Museum, Archives and Mackenzie Centre, Trochu and District Museum, Athabasca University, and Sodbusters Archives and Museum). Thanks to the following individuals for their contribution: Emily Parsons, Courtney Lakevold, Joseph Werner, Joshua Gonzalez, Colleen Dirmeitis, Brad Himour, Julien Favreau, Julie Martindale, Mike Donnelly, Vern Johnston, Keary Walde, Daryl Heron, John Visser, Christie Grekul, Tom Andrews, Dale Walde, Jessica Hill, Sean Britt, Sean Sheedy, Dennis Milner, Janice Andreas, Jean-Paul Foster, Chuck Berry, Dan Meyer, Bob Dawe, Jack Brink, Darryl Bereziuk, Eric Damkjar, Trevor Peck, Shawn Bubel, Shirley Harpham, Jennifer Hallson, and Jack Ives. Lastly, thank you to the Archaeological Society of Alberta and its centres. Hi Marjorie, thank you for your comment. The Archaeological Survey of Alberta has a Report A Find program where people can share their archaeological finds with us (http://culture.alberta.ca/heritage-and-museums/programs-and-services/archaeological-survey/archaeological-discoveries/default.aspx). You can contact us at 780-438-8506 or by e-mail at courtney.lakevold@gov.ab.ca. Regarding the obsidian artifact in the Standard area, Todd Kristensen will get in touch with you via e-mail. Thanks! Thank you Todd for your informative article. Here in Battle River region several organizations have benefited significantly from the assistance provided by Alberta Archaeological Survey. Some of them are Friends of Fridhem Society (we have some of your posters on the walls in the social area of Fridhem historical church), ALL (tours to some of the regions where the AAS is active – Boss Hill, Sounding Lake/Neutral Hills, Bodo, Battle Lake, etc. ), Battle River Institute, and the Battle River Water Ceremony. Interest is growing each year, so please keep the good information coming our way! I have recently found a rather large piece of obsidian among my father’s collection of rocks. It was found in the 1950s near to Opal. I’m wondering if someone might be interested in having a look at it. Yes, I’d love to look at it. Thanks a lot for sharing the information and I look forward to getting in touch with you by e-mail to learn more about the obsidian! I Like the article. I was interested about it saying that there was no natural sources in alberta. I’ve found raw pieces not far from my house along a Creek in West central alberta. 6″ squared and sometimes larger. I’ve never had them professionaly tested.